1. Stir together the olive oil and 2 tsp of the Baharat spice blend. Split open the pittas and brush the open sides with the spiced oil. Cook under a medium grill for 1–2 minutes on each side until golden and crunchy, then set aside to cool. 2. 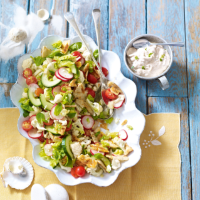 In a large bowl, mix together the cucumber, cauliflower, tomatoes, radishes, lettuce, salad onions and lime juice. 3. In a separate bowl, mix together the yogurt, garlic, mint and remaining Baharat. 4. Break the pittas into small pieces and stir into the salad mixture. Divide between 4 plates and serve each with a spoonful of the minted yogurt. Try using a 200g tub Waitrose Tzatziki in place of the yogurt dressing.